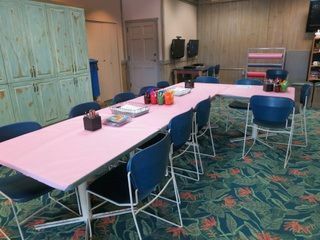 Did you know that there are places at Walt Disney World where you can paint pottery, play Monopoly, shoot some pool, borrow a movie, get in some Wii time, or just kick back and, you know, relax? 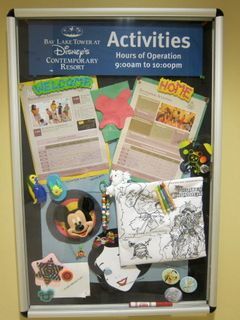 All that and more happens at the Disney Vacation Club (DVC) Community Halls. Where are the Community Halls located? There are also Community Halls at the DVC facilities at Aulani, Hilton Head and Vero Beach, but I’ll be talking specifically about WDW. What do the Community Halls look like? 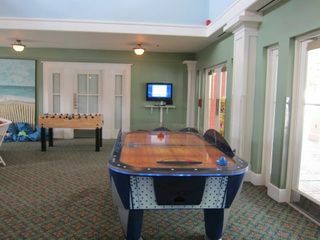 Picture a basement rec room or the hang out center at your local YMCA, only cleaner and brighter. I mean this description in the best possible sense, the Community Halls have a low-key, make-your-own-fun vibe that just says “old-fashioned Americana vacation.” They’re the polar opposite of the candy-colored perpetual motion of the theme parks. Why would I want to visit a Community Hall? They’re a great place to change the pace of your vacation. If you or your child is in stimulation overload mode, a Community Hall is a nice place to chill out for a while. They’re also a resource if you’re planning to spend a day without venturing into the parks. The Community Halls can also be a refuge on a rainy day, or an air-conditioned break during a steamy afternoon at the pool. Some families will use the Community Halls as a hang out space for older children and one parent while the baby naps in the hotel room during the afternoon with the other parent. What’s available at the Community Halls? 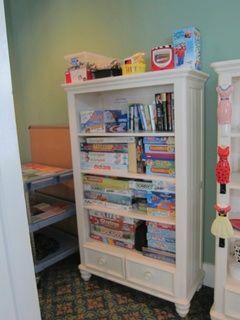 A large collection of classic board games: Sorry, Monopoly, Battleship, Trivial Pursuit, checkers, Life, Clue, playing cards, or similar. One or more large activity tables such as ping-pong, pool, or foosball. TVs for viewing or gaming. Systems may include Wii, PSP, XBox, or others. Several hundred DVDs available to borrow. Art supplies such as paper, crayons, markers, glue, scissors. More intensive craft projects such as pottery painting, tie-dye, jewelery making, or sand art. A small supply of novels and magazines for guests to take one/leave one. Building toys such as blocks, Legos, or Bristle blocks. Occasional organized activities such as Bingo or trivia games. Who can use the Community Halls? While the Community Halls are designed for Disney Vacation Club members, they’re quite lenient about who can use these centers. If you’re staying at any of the resorts with a Community Hall, feel free to use the hall, even if you’re not a DVC member. This means, for example, that anyone staying in either section of the Animal Kingdom Lodge could use the Kidani Community Hall, including DVC members, those renting points, Villas guests paying cash, and even guests in standard non-villa rooms. The only somewhat restrictive Community Hall is at Bay Lake Tower, You’ll need a BLT room key or MagicBand to get into both the building and the Hall, which makes it difficult for guests of the main Contemporary resort to use the facility. I’m a DVC member, but I’m not staying at one of the resorts with a Community Hall, can I use one anyway? Sure. Bay Lake Tower can be a problem, but DVC members can use any of the other Halls at any time with no issue. So if, for example, you’re a DVC member staying at the Beach Club Villas, feel free to stroll over to the Boardwalk Community Hall if you’re in the mood for a family Scrabble tournament. 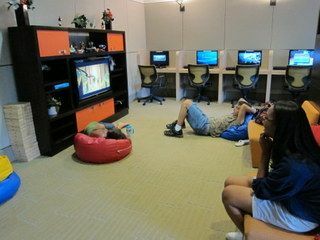 I’m not a DVC member and I’m not staying at a DVC resort, but my kids need some down time, can I use a Community Hall? Not officially, but again, with the exception of BLT, they’re not too strict about checking resort IDs. If you’re not staying there, it might be somewhat inconvenient for you to shlep over to Saratoga Springs just to play foosball. 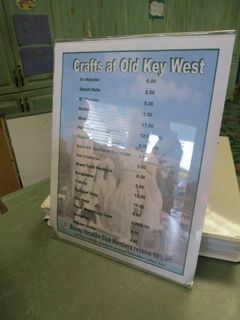 But if you’re at the Yacht Club and your child is dying to do a craft project, then head over to the nearby Boardwalk Community Hall. If you ask nicely, they’re unlikely to turn you away. Are there specific hours for the Community Halls? Each of the Community Halls will have its own posted hours. Generally the Halls will be open from at least mid-morning until 9:00 p.m., but this can vary. Check with the front desk of the hotel for specifics. For some of the more elaborate craft projects, there will be a specific schedule of events. You can always pop into a Community Hall for board games or coloring, but something like Tie-Dye will only be available at certain times. The schedule will be posted at the Hall, or you can call the front desk to inquire. Is there a fee to use the Community Halls? For the most part, no. There’s no charge to hang out there, play games, watch TV, etc. There will be a nominal charge for the larger craft projects. Are the Community Halls crowded? Generally not. However, if there’s a stretch of particularly bad weather, more folks may show up. How is the Community Hall different from the Children’s Activity Centers? The Children’s Activity Centers have some of the same characteristics as the Community Halls. Both have games, art projects, video games, and movies. However, the Children’s Activity Centers are fee-based, drop-off babysitting centers for children ages 3-12. The Activity Centers are usually only open in the evenings, from about 4:00 p.m. until about midnight. The Community Halls are open to all ages, for longer hours, and parental supervision is required. There are helpful cast members at the Community Halls, but they’re not there to babysit your children. Animal Kingdom Lodge is the only WDW resort that has both a Community Hall and a Children’s Activity Center. I’ve paid a zillion dollars to take my kids to Disney World. Should we really be wasting our time at place like Community Hall? I get it. You can play checkers at home, why waste time doing it here when Mickey Mouse is just a monorail away? 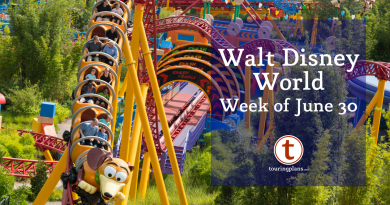 If this your first Disney trip, or if you’ll only be at Walt Disney World for three or four days, then something like this might not be on your agenda. But if you’re theme park veterans or spending a substantial amount of time on site, then a Community Hall might be just what the doctor ordered – a chance to step back from the mayhem and enjoy spending time with your family without all the hubbub of home life spinning around you. Sounds pretty good to me. Have you ever spent time at a Walt Disney World Community Hall? Did you enjoy it? 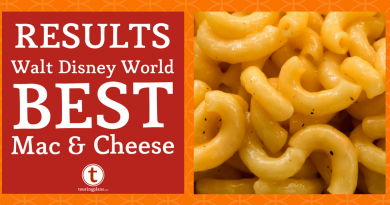 Is this something that you’d consider making part of your Disney vacation? Let us know in the comments below. Is there a charge for borrowing the DVDs? Nope, it’s free! If you don’t return them before check-out, your room gets charged. We use them all the time, especially when we have a lot of people in our group. They are a great staging place for gathering your group before heading to a park, a meal, the airport, etc. They are often empty, especially in the morning. Rain fills them to capacity, but that is fun too, because you get to meet others from all over the world, and paly a game or just talk.